While I've spent what is now a near-innumerable number of days on the road visiting post offices, I've never actually documented a full day's travels -- until now. We began the afternoon of January 27 visiting post offices #2,996 to #3,000 in my previous entry. Let's see what else happened as the day progressed. While this building was nothing out of the ordinary, the large, 2.5-inch-diameter postmark with massive, slightly warped lettering absolutely was, and makes a stand out in my postmark collection. Speaking of postmark collections, and speaking of Beverly, Beverly Proulx is the curator of the Post Mark Collectors Club's non-profit philatelic museum in Bellevue, Ohio -- which maintains the world's largest collection of postmarks. She does a wonderful job and would love to speak with you if you think you might have a donation. Just sayin'. Sara liked this CPU -- her first visit to a postal contract unit! In fact, she found a little gift for her friend here. I bantered with the postal clerk in the back and received a nice four-bar cancel. While it wasn't designated explicitly to the office, it was a different dater than the Burlington PO's. All minor postmark variants are valid collector items in my book. This was a surprise. Not the post office itself, which was architecturally bland with that new white-on-blue signage... Rather, it's what happened next is one of those first-times-for-everything experiences. To understand it, it helps to know a little bit about Roebling. If the name sounds familiar, it might be because John Augustus Roebling, among his other accomplishments, designed the Brooklyn Bridge. He designed it to withstand loads of more than seven times what he thought the maximum could even be, and that helps to account for the bridge's resilience. Roebling also had a company to make his own wire. 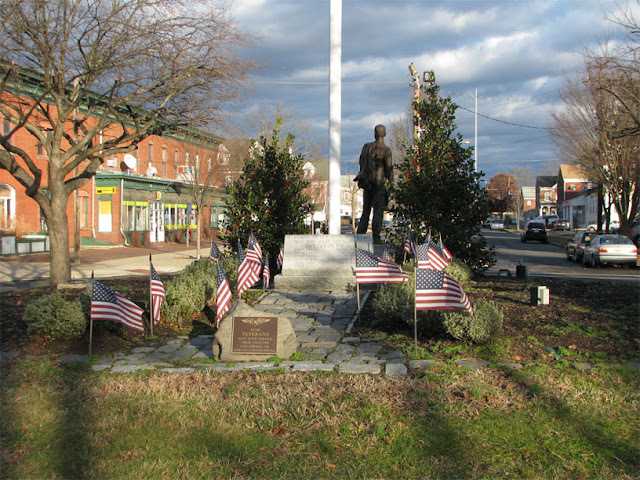 Roebling, NJ was founded by J.A. Roebling's son as a steel mill town. This mill made, among other things, the cable wires for the elevators of the Empire State Building, as well as the cables for the Golden Gate Bridge. This isn't too unusual in and of itself -- but my taking these photos caught the attention of a local resident who was returning home, and she invited us to follow her to see something interesting, since I told her that I enjoyed exploring the history of the towns that I visit. Obviously, we followed. That said, this was the absolute coolest part. Yes, it works. 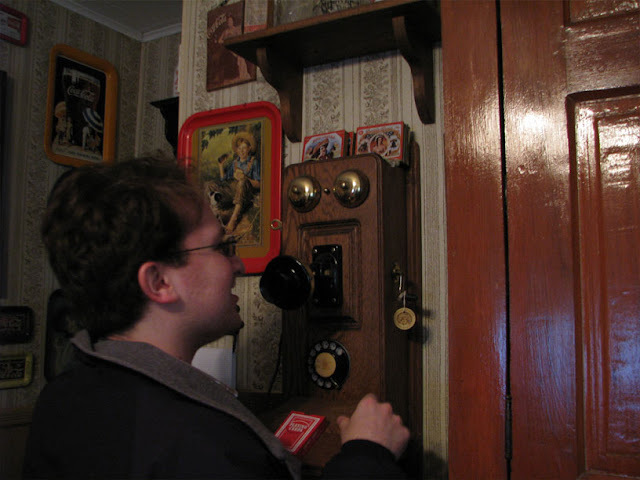 And yes, physically dialing a phone number took a realllly long time. Wow. Okay -- I hate to call offices out by name for things, but they closed at least five minutes early, and I had to knock and plead for them to give me a postmark -- which they did, thankfully. Still, I have rarely (if ever) known that to happen ... and in the other two instances I can recall offhand, the locations in question were CPUs. 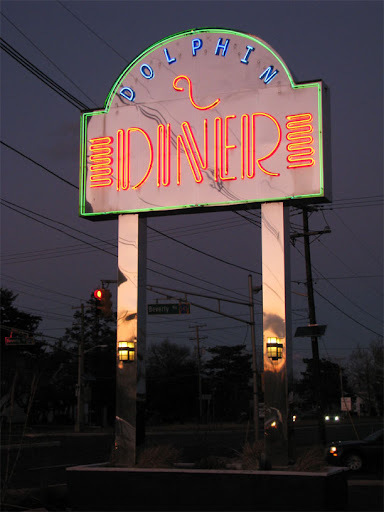 No afternoon in Jersey is complete without a dinner at a Jersey diner. Sara and I cruised down Rt. 130 and settles on the Dolphin Diner in Burlington, which we'd seen on the way north. The specials were akin to Floridian Early Bird specials -- awesome! Sara had breakfast for dinner. I'm not sure I've ever found a regular post office closed early, but I've certainly found a few staying open a little late. One time I did find an office not yet open for the day, 20 minutes after the posted opening time. CPUs, on the other hand, aren't always so good at sticking to the posted hours. Too bad your picture of the Burlington Post office (#3002) misses the statue of Mercury done in cast iron and gold leaf in front of the post office. Good catch. I got it from another angle; didn't post that one here.